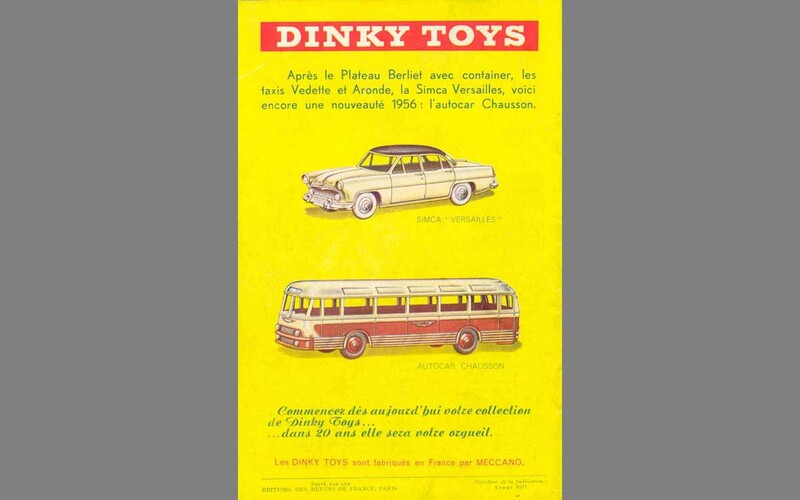 The Dinky Toy, introduced in April 1956 and discontinued in November 1960, represents the real one very well, with its symmetry, the curvy roof, the chrome strips and the winged Chausson logo. 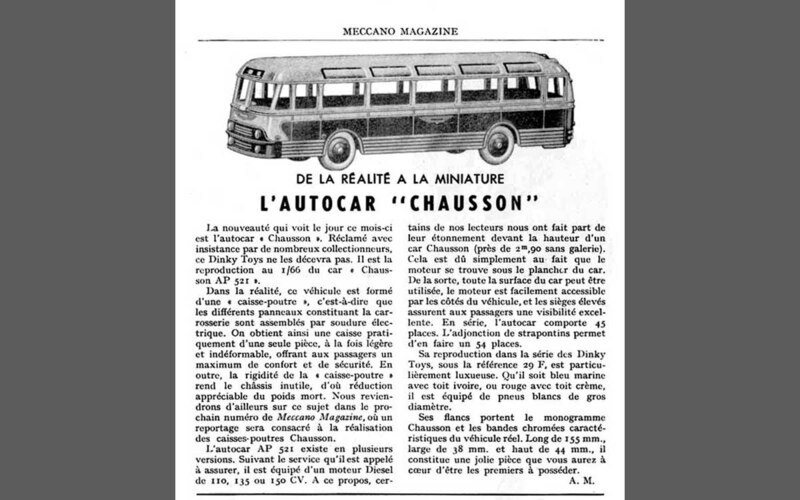 The characteristic imperial, seen on many pictures of the real Chausson AP 52, is missing, because it is hard to realize on such a 1/66 scale all-diecast toy bus, of course. 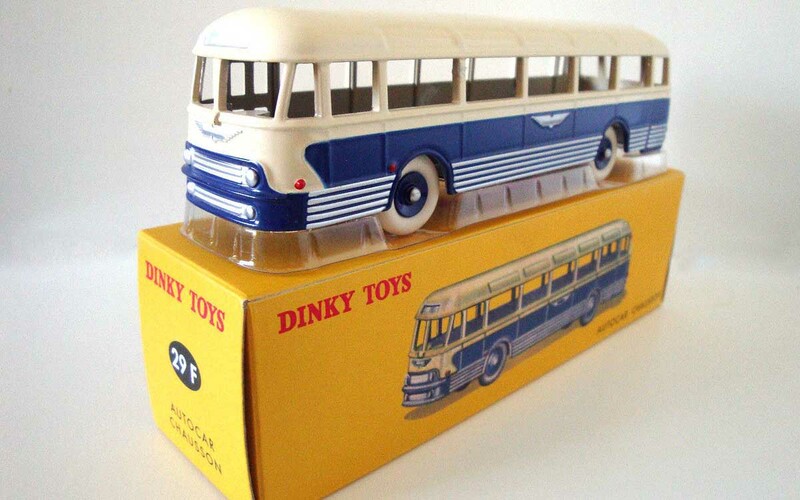 This scale is larger than the usual Dinky bus scale, both French and British. The no. 29h Duple Roadmaster Coach, ca. 1/77, could be seen as its British counterpart. In fact, the old numbering system of the joint buses from both sides is partly complementary, partly overlapping. 29h Duple Roadmaster Coach (GB). Most examples of the Chausson coach do have the convex hubs, replaced in the final batches (and renumbered 571) by concave ones. The medium size smooth white tyres give the model a characteristic appearance. 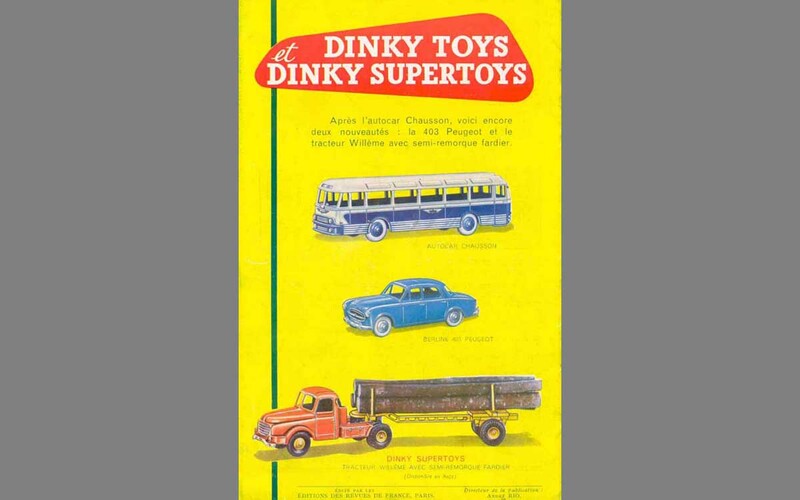 The individual yellow Dinky Toys box with end flaps shows the model in both colours available: red and cream roof or dark blue and cream. The latter a bit scarcer in its final appearance with concave hubs. The cream may vary from yellowish to off-white, mostly in a slightly satin finish. Contrary to the actual model the models illustrated on the box are fitted with black tyres and the red one seems to show a red interior instead of cream. Roulet (2nd ed., page 326, ill. 1350) shows such a model, which is thought to have been used as a prototype for this drawing. The red one is also shown at the back cover of the French MM of April 1956, represented by the same illustration as on the box. Catalogues, like the 1957 issue in French and Dutch for the Belgian and Dutch markets, show a new, different representation of the red one. In June, however, the blue one is presented (accompanied by the newly introduced Berline 403 Peugeot and the announced Tracteur Willème avec semi-remorque fardier). 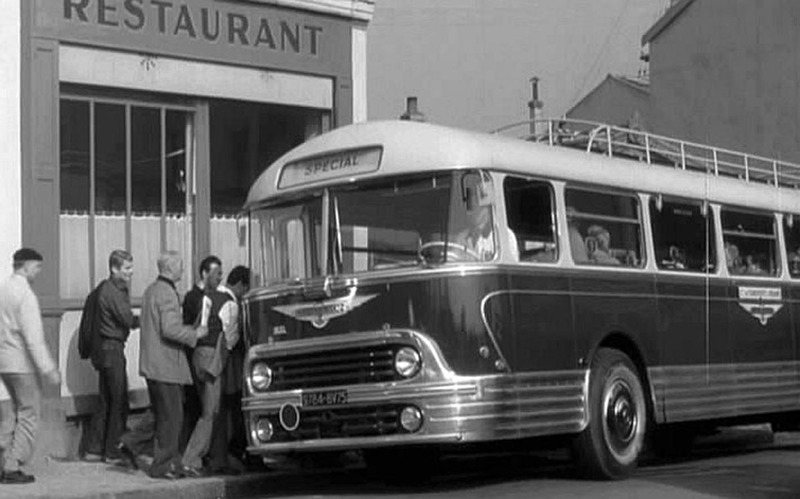 The Chausson bus did not have a very long life, 1956-1960, compared with many successful French commercials, which sometimes lasted until 1970. 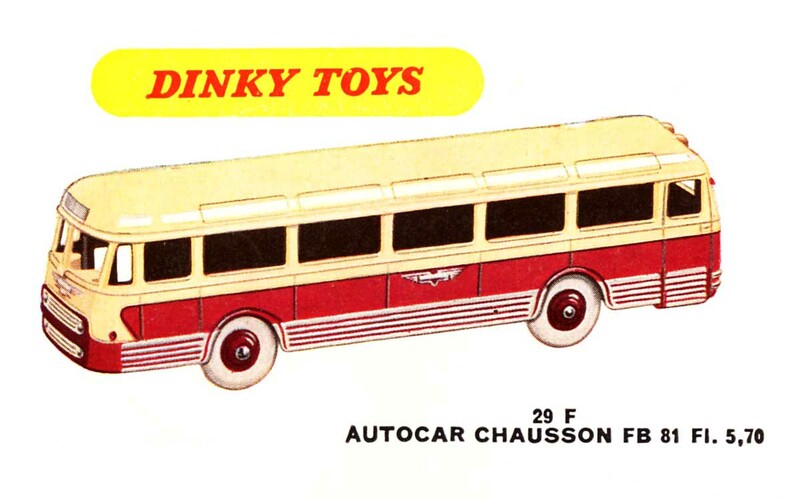 Perhaps the price – 1/77 scale buses were much cheaper – has been prohibitive. And, admittedly, the real vehicle was introduced and discontinued some years earlier already. The real-world touringcar represented by the Dinky is a Chausson AP 52, ‘car de ligne grand luxe’. 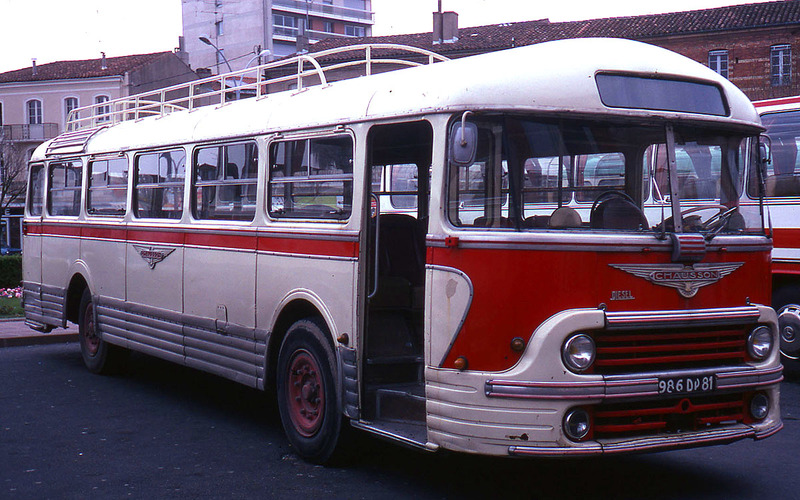 The Société des Usines Chausson produced touringcars in the era 1942-1959. For a long time this brand was the uncontested leader on the French market for long-distance coaches. Having previously produced 'pig nose' buses and coaches, this innovative forward control AP 52 was the new image of the Chausson coaches. The AP 52 was introduced at the Salon de l’auto­mobile in October 1951 and production was started in April 1952. Until October 1953 1510 were built.